SoulCollage® is a collage process in which someone makes a personal deck of cards, one card at a time. It is easy, fun and satisfying and can be used by individuals or in groups. A SoulCollage® Deck is the Story of You. "It is a tangible way to know yourself in your diversity and depth, and also to show yourself to others. Showing your deck of SoulCollage® cards to another person can be a profound experience. In like-spirited groups, you can share cards and work with them in many sacred ways. You can consult them intuitively and discover wisdom within yourself which will amaze you. Besides all this, creating them is just plain fun! You will love your deck -- a multi-card Mirror of your Self and your Soul -- whether it consists of three cards or a hundred." The SoulCollage® system is based on the principle that there is one Source from which everything manifests - the Many which come from Source. The deck we make is the evolving collage of our Soul. Cards usually find their place in one of four suits, and can be consulted to help us answer life's questions. SoulCollage® cards are not used to "read" for others. When we consult our cards, we use the phrase "I am the one who..." to begin speaking from the image. Sharing SoulCollage® cards in community is an important element, bringing people together in creativity, acceptance and self-reflection. 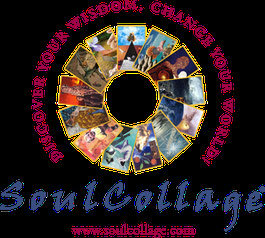 SoulCollage® cards are made for personal use and are not sold, traded, or bartered. SoulCollage® is a trademarked process, developed by Seena Frost and described in her book "SoulCollage® Evolving". SoulCollage® does not advocate copying or infringing on the copyrighted work of others in any way. Thank you to all the wonderful photographers and artists whose images inspired us to recreate and discover our inner and outer worlds. Please read the SoulCollage® Principles, before you start to use this method - thank you!